Have you ever seen that hilarious short about Mr. Bean going to church? He sits next to a proper English gentleman (played by famous Shakespearian actor Richard Briers) and makes a complete fool of himself, as usual. He has an episode with a dripping nose, which he finally wipes on the inside of his coat pocket, and a mint he keeps trying to eat without his neighbor seeing him. Because he’s thoroughly annoyed his neighbor, the man won’t share the hymnal, so Mr. Bean hums along wordlessly until they reach the “Alleluias.” Suddenly recognizing the tune he bursts out in full voice feeling relieved that he finally knows the words. This continues until the final extended “Alleluia” when he sounds like a typical Latter-Day Saint congregation who doesn’t realize that a dotted whole note lasts for the entire 3 beats in the bar and they try to resolve it too early. Hymn #62 is one of the most beloved and most well known hymns in all of Christianity. The melody is an old German tune from the early 1600s. British composer Ralph Vaughan Williams, a great composer of symphonies, concertos and choral music, was the editor of the new English Hymnal from 1904-1906. Though he composed many great masterworks which are still performed today by the world’s finest symphony orchestras, he was dedicated to folk music. His work on the English Hymnal stayed with him throughout the rest of his career and he found many opportunities to quote hymns and use them to compose seres of variations. The tune itself is rather repetitive. There are only 3 blocks of melodic music in the whole thing. Take a look at the melody. “All creatures of our God and King.” That’s the first melodic block. But it gets repeated exactly right after it’s first heard. “Lift up your voice and with us sing.” Let’s call this Block A. So we get it twice, A1 and A2. Notice that while the soprano part, the melody, is exactly the same, the harmony beneath is not. After these 2 opening phrases we come to the first of the “Alleluias.” Notice again, they are 2 repeated blocks of melody. We’ll call them Block B; B1 and B2. Once again, Vaughan Williams do not accompany the repeated melodic block with the same harmony. Ok, we’re detecting a pattern here. Let’s see if he continues this course of actions. Because we haven’t heard this tune before, we’ll give it it’s own letter. Let’s call it Block C; C1 and C2. Yet again, though the melody is repeated exactly, Vaughn Williams doesn’t miss a chance for alteration and variation in the harmony. After block C we get 2 more “Alleluias” and both are again on the Block B melody. But this time they start on a mid-range A-flat instead of the high E-flat they started on above. But, they are they same melodic blocks as before, so we’ll call them B3 and B4. Directly after B3 and B4 we return to melodic blocks B1 and B2. Can you guess what Vaughan Williams does with this repetition of Blocks B1 and B2? Do you think he keeps the harmony the same as before? No way, Jose. The final “Alleluia” is also familiar. But which block does it come from? Can you find it? It’s B3, but it’s slightly different. The “-lu-” of “Alleluia” is stretched out 3 times the length of the original to make for a satisfying final cadence . The harmony Vaughn Williams uses throughout is mostly diatonic (it stays with the key signature). There are a handful of A-naturals and there’s an E-natural in the last line. 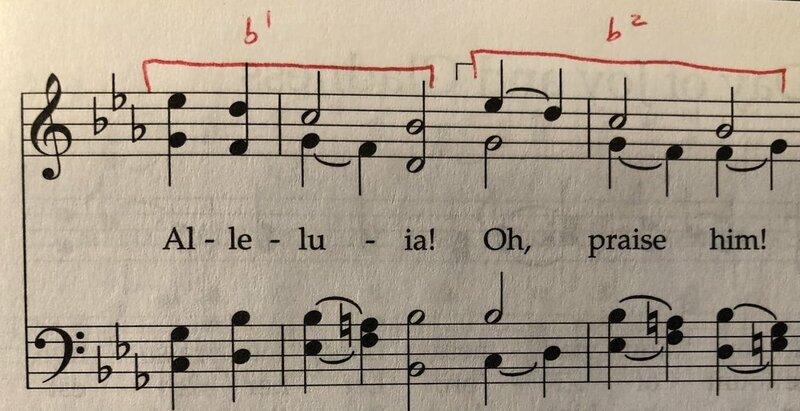 These raised accidentals provide a few secondary dominants and they only occur during the “Alleluias” as if to say that by praising God in “Alleluias,” our spirits (and our flats) are raised up! So if the harmony is mostly diatonic, what makes it so interesting from start to finish? I think it’s 2 things. First, the constant motion. Each voice moves and moves throughout the whole hymn. There isn’t a dull or stagnant moment. All the creatures of earth are joining in the celebration. Even those wild animals, the basses, are joining in. And they move most of all. What a fun bass line! Second, Vaughan Williams goes to great lengths to re-set the repetitive melodic blocks, as I’ve mentioned above. I wonder, how many composers, had they been given the task to set this old German tune and make it a great worship hymn, would have employed so much variation? I bet many would have succumbed to the temptation to “copy and paste” some sections of music because the melody does just that. Luckily, Vaughan Williams was a 1st rate composer and he used his remarkable skills of variation and development to compose this majestic favorite setting. That’s all for today! We’re headed back to the sealed portion tomorrow. P.S. Do you have a friend that would be interested in these posts? Please share this link with them and encourage them to click the button below and subscribe. Thanks! A beloved hymn across almost all traditions of Christianity, this hymn holds a deserved beloved place in hymnody. The tune is majestic and eminently singable, the Ralph Vaughan Williams harmony is delightful, the text inspiring, this hymn bears all characteristics of an all-time great hymn, deserving of its place in the canon of hymnody. Karen Davidson observes that “J. Spencer Cornwall offered the opinion that ‘this magnificent hymn, when sung by a congregation, should be performed in unison.’ A close adherence to tempo markings will help the congregation have adequate breath to sing the phrases exultantly, particularly the last ‘Alleluia!’” Indeed, in all other hymnals that I have seen this hymn, it is in unison, with harmonization provided only for the organist. The indicated tempo markings referred to by Sister Davidson are half note equal to 66-76 beats per minute. This tune dictates that 76 is probably the slowest that this hymn should be played. A more appropriate tempo range is 76-84 beats per minute. This gives the hymn tremendous lilt, forward drive, and excitement. At the fermata, I only add one extra beat (half note), and help the movement along by moving up the octave to the B flat on the second beat for a quarter note then stepping down to an A flat on the second quarter note. It steps nicely into the third beat of the measure and moves things along. One other item to note is the third to last measure in the second half of the first beat, I often hear an A natural played in the “tenor” line, but it is notated as an A flat. Something to be aware of. This hymn sequentially in our hymnal is in a long line of stout hymns that call for full, robust, exciting registrations. Like the previous hymns, a plenum (even built on 16’ for the first and last verses) is called for with use of chorus reeds, utilizing the full resources of the organ for the final verse.